If there was a common feeling among the Corbett Fire Department volunteers called to fight the Eagle Creek Fire last summer and fall, it might be summarized as helpless. 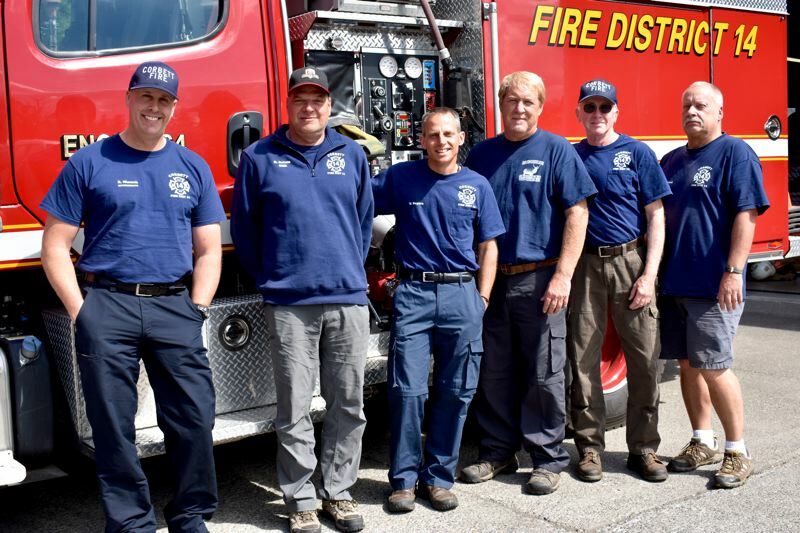 That's the word firefighter Rick Wunsch used when recalling his experiences with fellow firefighters Brad Loitved, Nelson Rolens, Larry Traxler, Daren Martin and Vance Rogers, which started with a callout on Sept. 3 to assist the Cascade Locks Fire department. The firefighters shared a common story about battling the blaze in the Columbia River Gorge while their family members were home waiting to see if they would be ordered to evacuate. While Wunsch was out on his mission, he said his mind wandered to his family in Corbett and if they were going to be OK.
"So there was a helpless feeling, even though you're helping, you're helpless," he said. Initially working in the Dodson-Warrendale area, Wunsch said the fire seemed pretty tame, but that changed the next day, on the afternoon of Monday, Sept. 4. "The wind came up and it exploded (in size)," he said. "That's when things changed quite a bit. You could look up on the hill and the wind was blowing. Immediately, we looked at that and said, 'It's coming to Corbett.'" Firefighters made calls back to the home station on the Historic Columbia River Highway, and anyone who was available went to work on the fire. "It was extreme. The 50 to 60 mile per hour winds, the heat, the smoke — all of that was headed right for us," Wunsch recalled. An evacuation order was issued on Sept. 5 for multiple areas including a portion of Corbett east of the 38700 block of the historic highway, just outside the edge of the order. The evacuation order wasn't lifted until Sept. 13. The Eagle Creek Fire was started by a 15-year-old boy throwing fireworks into the Eagle Creek Canyon on Sept. 2. The blaze ultimately consumed more than 48,000 acres in the Columbia River Gorge. A portion of the historic highway remains closed along with several popular hiking trails as forestry crews work to remove dead, dangerous trees and restore trails for safe passage. The boy, whose name authorities have not released, was recently ordered to pay $36 million in restitution. While all Corbett firefighters have experience working on wildland fires, the Eagle Creek conflagration was the largest any of them had been required to tackle. Rogers was celebrating his 49th birthday on Sept. 3 when the first Corbett crews responded. "While I didn't know the size of the fire at that time, I knew that no more personnel were requested," Rogers said. "By Sunday night we were seeing updates on Facebook about the growth and the story on the news about the young man who started it. With Monday's winds picking up, we could smell the smoke and breathing started becoming difficult." After a week working with the federal conflagration unit, Corbett crews were called back to their own station. Nelson Rolens praises the calls unit leaders made regarding who was needed where. "We did get pretty fortunate 'cause we did get assigned back to our area," Rolens said. "That did make sense for us. We felt really good about it, which was logical for the decision makers to do that because we know the back areas. We know the families we need to talk to; we know where some of the more susceptible elderly people might be." While a few of the firefighters were out in the field, Vance Rogers was knocking on doors informing citizens that an evacuation was likely. While he was out warning others, a Multnomah County Sheriff's deputy informed Rogers' wife that it was time to leave. 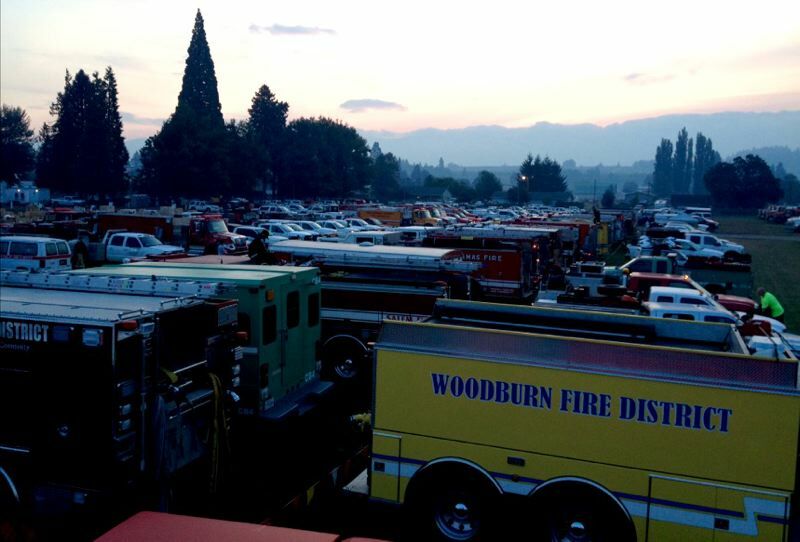 At the height of the wildfire, conditions for firefighters were taxing, regardless of the time of day. While about half of the Corbett department met at the Vista House at Crown Point one morning around 1 a.m., Rogers said a firefighter used his smartphone app to read the temperature: It was 104 degrees. "Cause the wind is blowing that heat," he said, "and we could see the flames." For months after the initial fire response, Corbett crews continued to respond to calls for hotspots. Often when Corbett crews were dispatched, they would discover a fire in the containment area and call the U.S. Forest Service, whose response would be "Let it burn." Before the wildfire erupted, the Corbett department was already encouraging homeowners to create defensible spaces around their homes. "The homeowners have to do a certain part: clearing limbs and pushing back trees and moving wood structures, because as a fire comes through it ignites those," Wunsch noted. While the Eagle Creek Fire was still burning, but not actively spreading, Corbett crews helped homeowners create such spaces. Overall, the experience served as a wake-up call to area homeowners. "They've gone and thinned and pushed back trees," Rogers said. "We all want to be at one with nature, but at the same time if you've got trees that are overhanging your house, that's just fuel. So a lot of people have done some clearing, and are opening space up." New property owners in the area have followed suit, and are maintaining spaces around their homes. "Since the fire and before, we have been working a lot with education to tell people in the area to get that defensible space put up," Wunsch said. Even though the Eagle Creek fire was contained on Nov. 29, it has yet to be declared entirely extinguished. A hotspot ignited on Tuesday, May 29, in the Gorge, but did not require a response from Corbett firefighters. The only injuries reported during the fire were two sprained ankles and a bee sting, noted Rachel Pawlitz, with the U.S. Forest Service-Columbia River Gorge National Scenic Area. 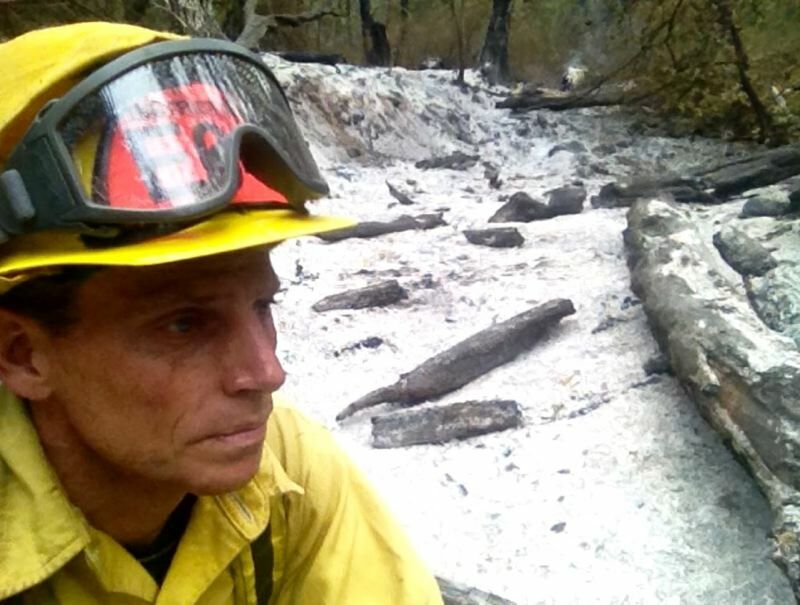 Reflecting on the fire and how it started, Rogers is among the Corbett firefighters who still struggles to come to terms with it. "My feeling toward the young man who acted carelessly in the area I've lived for almost 40 years is something that I still wrestle with," he said. "The environmental, economical and emotional impact will be felt for years. Standing in 6 inches of ash brought a flood of anguish, because like several of the firefighters I was serving with, I didn't know if I'd be going home to the same destruction. "The impact of the Eagle Creek Fire will be felt for decades to come," he added. If any good could come of that, Rogers is hopeful those who take in the Gorge's beauty will exercise more caution than before. "I hope everyone who visits the Gorge will treat God's beauty with respect." With the exception of a part-time fire chief, the Corbett Fire Station is entirely volunteer run, and 37 men and women serve at the station. "It's our community," Traxler said. "Honestly, you get more out of it than you put in," Loitved said. "That saying that it's 'better to give than receive' is a very true statement," Wunsch said. "You could probably ask each one of them, and you'll get the same answer," Wunsch said. The Corbett Fire District coverage area stretches from east of the Sandy River to Multnomah Falls and from south of the Columbia River to Clackamas County. It also includes parts of the Columbia Gorge National Scenic Area, several Oregon State Parks and Recreation Areas, U.S. Forest Service lands, Interstate 84 and unincorporated communities of Corbett, Springdale, Aims, Latourell, Bridal Veil and Coopey Falls. District firefighters respond from three volunteer fire stations in Corbett, Springdale and Aims.